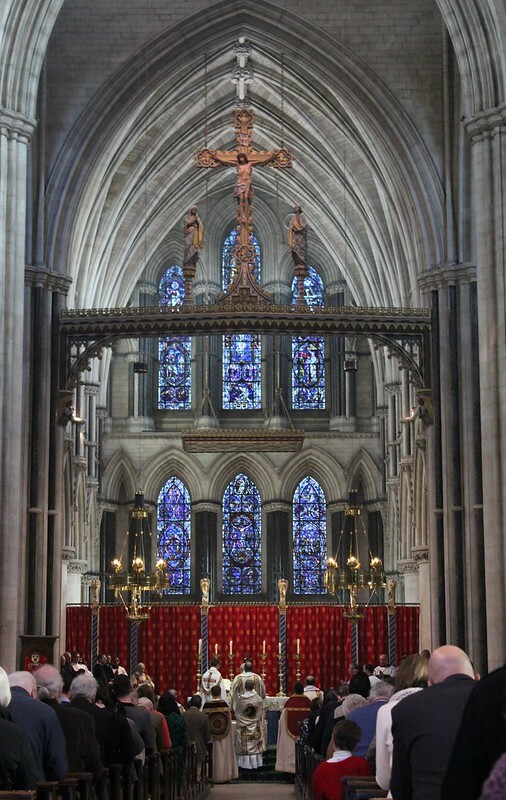 On Saturday, All Saints' Day, Bishop Alan Hopes of East Anglia celebrated Mass in the Extraordinary Form in his cathedral in Norwich, 'from the throne'. 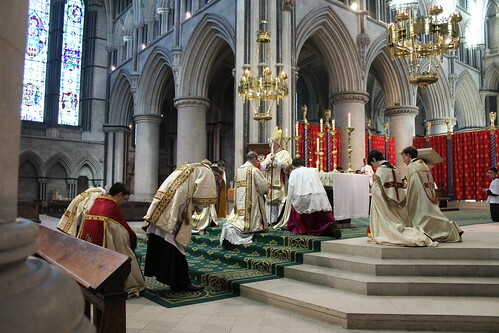 Various bishops have celebrated the Traditional Mass in various places, but this is the first celebration by a bishop in his own cathedral 'from the throne', that is, in the most solemn form. Bishop Hopes is used to celebrating the EF; as an auxiliary bishop in Westminster he did this at least annually for the Latin Mass Society for a number of years. We had been asking for Traditional Masses in Norwich Cathedral for some time, notably for a Requiem for a couple who were parishioners and had left money for this purpose. We were therefore delighted when Bishop Hopes told us, after his appointment to East Anglia, that he would break the ice by celebrating an EF Mass there himself. Norwich cathedral is very impressive, and a wonderful setting for the Traditional Mass. We are very grateful to Bishop Hopes for making it happen. 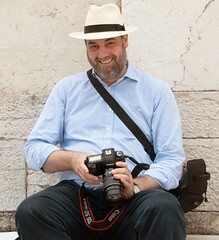 Photos, from 'Juventutem London', here. This is nothing more than a shameless attempt to increase vocations to the priesthood. It was a well attended mass, with several families with little ones: a fantastic all saints celebration!! I have traced my family tree to that area. All were 'Church of England' protestants until finally we come to me, a Catholic who attends the traditional rite only. Praise be to God. This is the start of something big. The lay people, by applying their 'Catholic Action' will let the Hierarchy at the Vatican know it is time to get back to doctrine, not novelty. The common Sensus Fidelium is rising! East Anglia in general has a very small Catholic population; like Sussex and the Cotswolds, it was s Puritan stronghold.